Part of the Volume on Digital Media, Youth, and Credibility Historically, credibility assessments assume a relatively explicit, effortful evaluation of message source and content, but this chapter argues that four technological features -- modality, agency, interactivity, and navigability -- can profoundly influence credibility judgments that are made more subtly and automatically while accessing information. 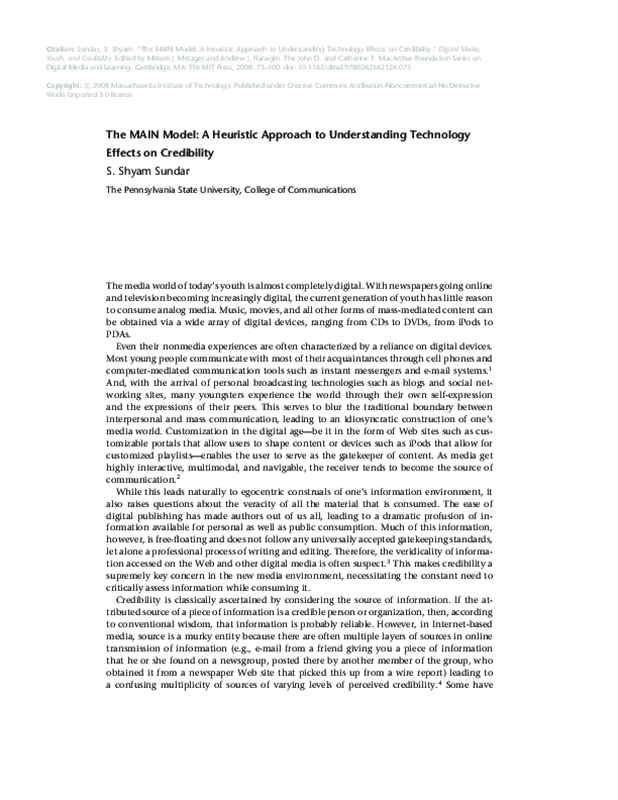 Based on research evidence that suggests today's youth pay more attention to these technological aspects than to source and content aspects, this chapter examines the ways in which they may shape credibility perceptions during digital media use. These features are conceptualized as "affordances" (or action possibilities) that suggest certain functions and/or transmit certain cues that trigger cognitive heuristics (or mental shortcuts) leading people to their impressions of the quality and credibility of the underlying information.